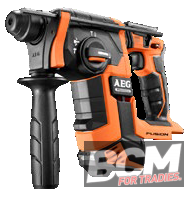 When you don’t have the time or energy to lean on a hammer drill all day just to drill a few holes in concrete or sink some masonry anchors, the AEG 18V FUSION SDS+ Rotary Hammer Drill will have you moving onto your next task before you know it. 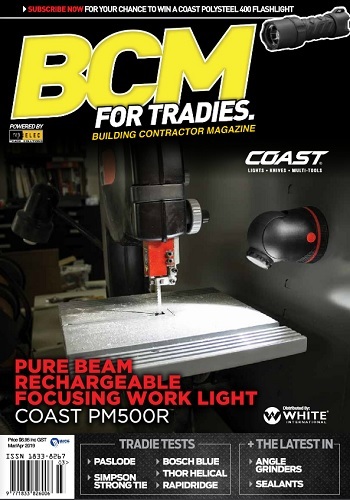 At first, you won’t believe this drill doesn’t have a cord, such is the power of the Advanced FUSION brushless motor, which delivers up to 50% faster drilling than the AEG brushed model (BBH18-0). Not only does it provide 4800BPM of high-speed drilling power, it also allows you to shift between three different drilling modes (rotary hammer, standard drilling and chisel-free rotation). For those of you interested in impact energy, this unit knocks out a massive2.5 joules. Many other 18V cordless SDS rotary hammer drills deliver fewer than 2.0 joules. Its electronic safety clutch protects you from any bit jams, while other features, such as the anti-vibration system, increases user comfort and decreases fatigue, resulting in better control. The AEG 18V FUSION SDS+ Rotary Hammer Drill also has a built-in heavy-duty rafter or ladder hook for easy storage and increased safety, and its LED sight light provides you with a well-lit work area. Once you’ve used this versatile powerhouse, you’ll wonder why you didn’t get one sooner.